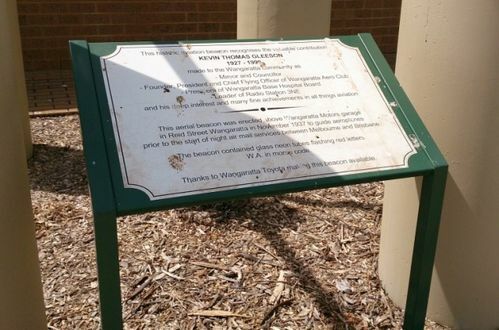 An aviation beacon at the Wangaratta Airport commemorates the community work of Kevin Gleeson who was a Mayor and Councillor of Wangaratta, President and Chief Flying Officer of the Wangaratta Aero Club, President of the Wangaratta Base Hospital Board, and leader of Radio Station 3NE. and his deep interest and many fine achievements in all things aviation. This aerial beacon was erected above Wangaratta Motors garage in Reid Street Wangaratta in Novmeber 1937 to guide aeroplanes prior to the stat of night air mail services between Melbourne and Brisbane. The beacon contained glass neon tubes flashing red letters W. A. in morse code.